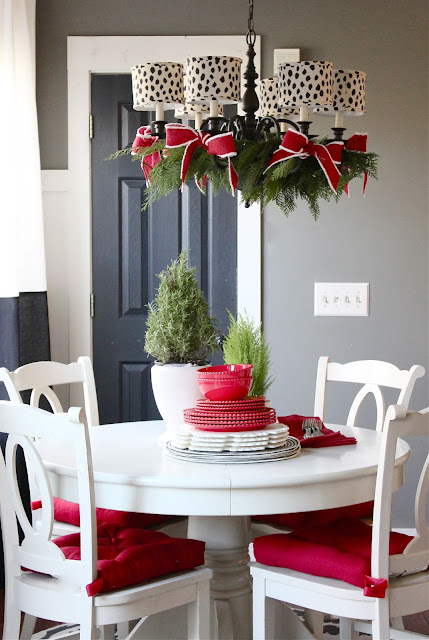 One of the most frequently asked questions I received on my Holiday Home Tour this year pertained to my dining nook chandelier decorating process. Today, I would like to share the four steps I took to create this look. It was very simple and something that we enjoy doing each year. We usually have a few holiday parties and as I mentioned before, we have a big Christmas morning breakfast tradition. Needless to say, we spend a lot of time in the kitchen and around this table during this season. I like to decorate this area and make it a festive place for my family and friends to gather. Since the dining nook is small and there is not a lot of room for extra "stuff", I focus on decking out the chandelier and getting festive with the necessary elements, like red dinnerware, to add the holiday cheer. 1. I chose which chandelier I wanted to decorate. 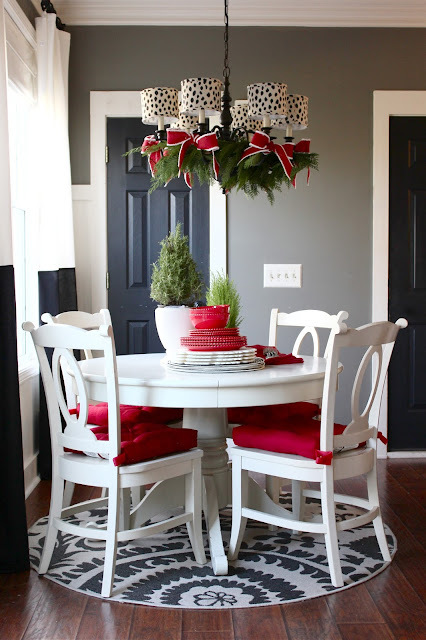 Since we spend a lot of time during the holidays in the kitchen, I chose our dining nook chandy. 2. Added cute shades. I found these at Ballard Designs and instantly fell in love. They are slightly large in scale and have a modern shape to them which gave my chandelier a fun new look. 3. Added Greenery. This year, I used cedar clippings that I purchased in a bundle from my local greenhouse. In the past, I've used fresh evergreen garland. Both worked great, all I did was simply placed the greenery around the inside of the chandelier so it is resting on the arms of the chandelier (away from the bulbs). 4. Finished it with bows. 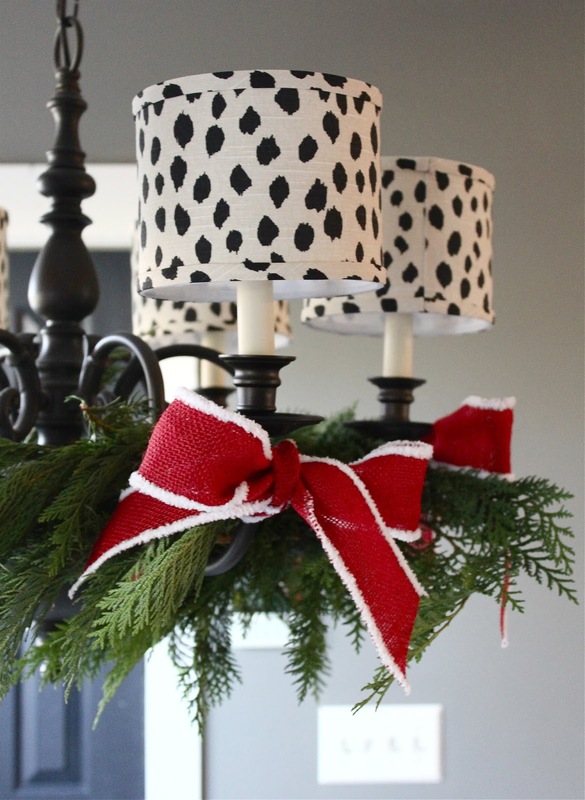 This year, I fell in love with this red and white burlap wire ribbon and instantly pictured it on my chandelier. I tied a small strip of ribbon around each arm of the chandelier into a bow and trimmed it so that all the bow ends were the same length. In the past, I have used thin strips of ribbon to hang decorative ornaments from each arm of my chandelier, as an alternative to the bows. That's it! 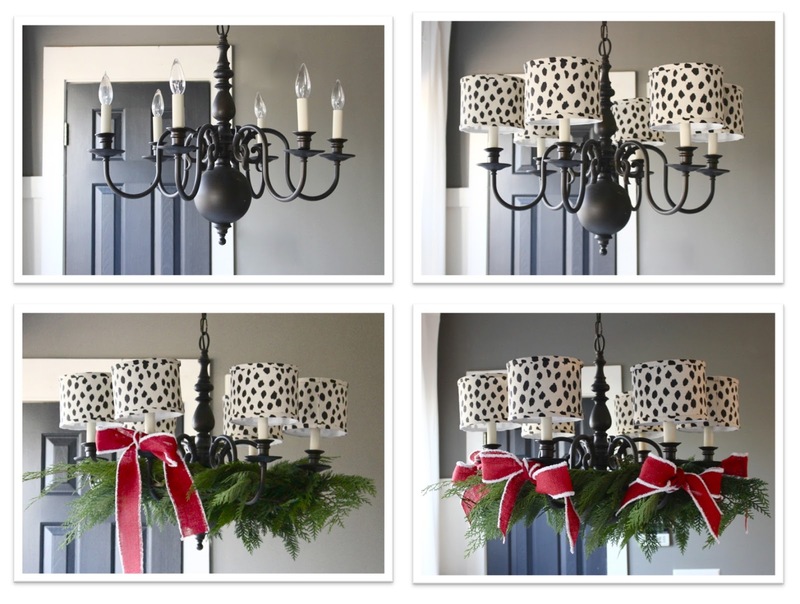 That is how I decked out my chandelier for the holidays! If you haven't had a chance to take our full 2015 Christmas Home Tour, you can check it out here.